Guatemala is one of the only remaining places where the living Maya culture can be truly experienced. This trip contrasts old and new, visiting modern indigenous communities thriving in the highlands around Lake Atitlan, as well as the early Maya cities of Tikal, Quirigua and Copan (Honduras). Hitting the highlights as well as getting far off the beaten path, this trip encompasses the beauty and colour of ancient Central America. Join tour Guatemala City and check-in to hotel. Guatemala City is the busy capital of Guatemala, most of which is modern build. However the colonial centre around the main square harks back to the time when the area was officially declared the new capital in the eighteenth century. We will start our day with a short orientation tour by bus of Guatemala City before heading to Copan in Honduras. This afternoon, you have free time to visit Macaw Mountain (optional). Everyone familiar with Catherwood's incredible drawings (which first appeared in John Stephens' 1841 narrative - 'Incidents of Travel in Central America and Yucatan') will recognise scenes and objects from this marvellous site. Stephens actually bought the entire site for US$ 50 from a local farmer! The Great Plaza is one of the most amazing achievements of the Classic Maya period (AD 750) and contains the greatest collection of Maya sculpture anywhere in Meso-America. The famous Hieroglyphic Stairway is composed of 2500 individual glyphs; its sides are flanked by serpentine birds and snakes. We have the whole day to enjoy this special place, leaving you plenty of time to explore on your own. The afternoon is free to either visit the museum dedicated to the site or visit Macaw Mountain. This morning we will stop en route at Quirigua, renowned for its fine Mayan carvings, covered with intricate glyphs which still remain a mystery to scholars and archeologists. 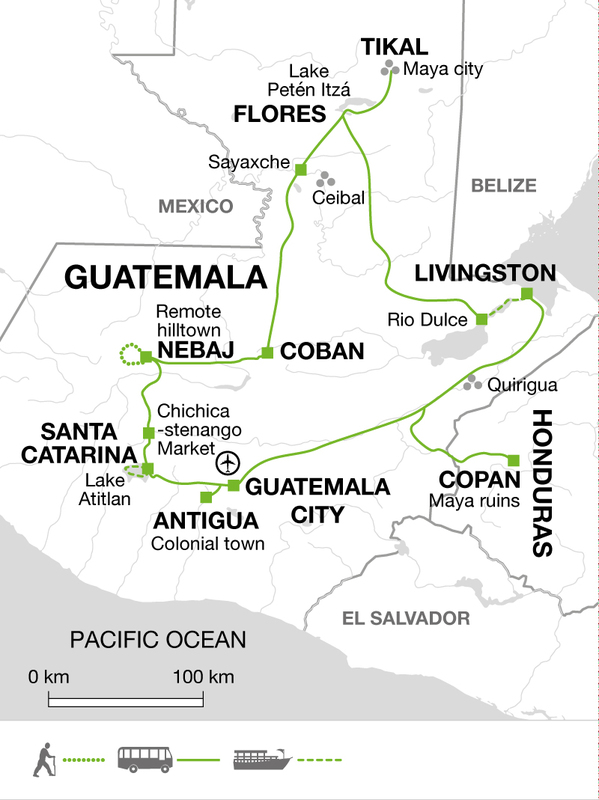 Quirigua was dominated by Copan but was valued as a trading centre for the jade that can be found throughout the surrounding area. Independence from Copan was finally achieved under Quirigua's most powerful leader, Cauac Sky in 737AD. We will then continue to Puerto Barrios where we will board our launch and cross the bay to the lazy, laidback town of Livingston on the Caribbean coast. Here we can enjoy the colourful, lively Garifuna town, with its unique racial blend. In the evening there may be the chance to hear the increasingly popular local music or enjoy the fresh seafood in one of the many restaurants along the main street. We start our day by heading west on the Rio Dulce by boat. The river squeezes through an impressive gorge of towering cliffs covered in a mass of jungle creepers with Egrets, pelicans and cormorants lining the shores. En route we will stop at the small community project of Ak Tenamit where you will have the opportunity to learn more about this educational support project that has been set up. From the town of Rio Dulce we will continue by bus to Tikal, possibly the greatest of all the Mayan cities, located in the heart of the Peten jungle. The ruins of Tikal can easily be compared with the masterpieces of Egypt and Greece. Initially settled about 600 BC, Tikal was abandoned by its rulers around AD 890 and totally deserted a hundred years later, overgrown by the jungle. Rediscovered in 1848, they comprise many great temples and pyramids. The city covers an area of more than 16 square kilometres with temples, palaces, causeways, ballcourts, spacious plazas, and hundreds of other architectural ruins - a superb example of sophisticated Mayan engineering. We will have an early start to get into the site for a guided tour. The site is so large we leave you free time to explore at your own pace this afternoon. Those with a good head for heights could climb one of the pyramids which pierce the jungle canopy for splendid views over the whole area. In the afternoon we will drive to Santa Elena. This evening we have a chance to wander the streets of Flores Island. Situated on a small island in the tranquil Lake Peten Itza and joined to the mainland by a causeway, Flores remains a quaint and peaceful town. Leaving Flores behind we head south into the southern mountains for a long day's drive through varied scenery. We drive to Sayaxche where we cross the river by ferry before continuing to the Candelaria Caves. Following our visit to the caves we continue onto Coban, where we will overnight. This morning we have a very early start to travel the short distance to Biotopo del Quetzal Reserve, as it is the best time to go bird watching. We start the day with a walk in the cloudforest; if we are lucky we may see the elusive quetzal which feeds on the fruit of the aguacatillo tree at dawn. The quetzal was sacred to the ancients of Central America and the plumed serpent god Quetzalcoatl was a supreme deity. Killing a quetzal was punishable by death and the 2ft long iridescent green tail feathers were worth more than gold. Today the resplendent quetzal is the Guatemalan national bird. Following our visit to the Biotope we will continue to Antigua. This morning we will drive to Sumpango, just on the hills outside of Antigua to see the All Saints 'Giant Kites' Festival. On November 1st of every year the people of Sumpango, Sacatepequez put together these giant kites to fly during the Day of the Dead. The kites are made of cloth and paper with bamboo frames, they depict religious or folkloric themes and they are flown to honor the dead. The kites traditionally can take up to 40 days to build, they are held together with a glue made with a mixture of yucca flower, lemon peel and water, the ropes are made of the maguey plant (the plant that also brings us tequila! ), and the tails are made from woven cloth. This tradition dates back 3000 years and still today is seen as a way of communicating with the beyond. After watching the spectacle we will drive to Santa Catarina, a small village on the shore of Lake Atitlan; there are always magnificent views of the impressive volcanic peaks of Atitlan (3537m), San Pedro (3020m) and Toliman (3158m) towering over the lakeside. The volcano-ringed Lake Atitlan is a place of stunning beauty. Some 24km long by 16km wide, it lies at an altitude of 1585m. On the first day, we include a boat trip to visit villages inhabited by Tzututils Indians, including Santiago Atitlan. Poignant reminders of the recent history of this village are visible as we visit the church, originally built in 1547, and we may see more traditional Mayan rituals at the shrine to Maximon. The second day is left free visit the popular town of Panajachel, where you can enjoy the comfortable climate, relaxed atmosphere and stunning setting. The lake changes hue at different times of the day and can appear green, deep blue, or grey, while at sunset it glows fiery red. Early this morning we drive to the famous market town of Chichicastenango, the 'sacred town' of the Indigenous Quiche. The Thursday market is a colourful affair which attracts people from the surrounding countryside to trade their produce and handicrafts. It is also the perfect place to pick up souvenirs of your visit. From here we continue our adventurous journey into the famous Ixil mountains. The drive is spectacular as we wind our way up through valleys and over hills, passing gushing rivers, heading north from Sacapulas. Finally we arrive at Nebaj, part of the lxil triangle. Accommodation available in this remote area is simple. The Ixil are famous for their fine weaving (some of the best to be found in Guatemala), especially the geometric designs in purple, green, yellow and red on the huipiles (blouses) worn by the Indian women. We spend the day exploring and plan to follow a trail over and out of the Nebaj Valley to the neighbouring valley . Weather permitting, we will enjoy good views of the mountain range as we walk up over a pass and descend to the village of Acul. We are bound to come across colourfully dressed Ixil using the trails, but there are certainly few other foreigners in this isolated area. We start this morning with a Textile demonstration from some of the local women before driving south. On route we will stop at the Mayan site of Iximche - a small site set in beautiful pine forests. After exploring the site we will then continue to Antigua de Guatemala, set in a beautiful valley between the volcanoes Agua, Fuego and Acatenango. After an orientation tour this morning you will have free time to explore Antigua further. An orientation tour of this graceful old colonial city shows how it can justly claim to be one of the most charming in Central America despite the damage caused by a series of earthquakes and floods over the ages. The afternoon is free to wander the timeless streets and hunt for souvenirs. One of its lively restaurants makes a perfect setting for our last meal together. Our tour ends this morning in Antigua. In the high plains (1524m-1981m) the climate is temperate all year round. In lower areas the climate is semi-tropical. The mountains can be cool especially at night. In general, the dry season in Guatemala lasts from Nov - April. From May to October there are often fine mornings and clear evenings but afternoon rains tend to be heavy. The Peten lowlands tend to be rainy all year round though less so from February to April. Climate change varies depending upon altitude. Mid range temperatures reach about 28°C. Rainfall is low to moderate with May to October being the wettest season. Temperature ranges in the lower reaches of the slopes and along the coast are more constant, with less rainfall. Copan - Macaw Mountain US$10; re visit ruins US$20. Lightweight clothing and a sunhat are essential in mid-summer though a warm sweater or fleece jacket is necessary for cool evenings in the highlands. A waterproof is essential. The jungle lowlands around Tikal are hot and muggy, and it can rain at any time of year. Long trousers and long-sleeved shirts are recommended on jungle walks. Bring a swimming costume. Comfortable trail boots with ankle support are essential for visiting Maya sites because of the amount of walking/climbing involved. Also trainers and/ or sandals. One main piece of luggage and a day pack. Remember, you are expected to carry your own baggage - don't overload yourself. Bring insect repellent, sunscreen, a sun hat, torch and a waterbottle. Local Crew: Although entirely voluntary, tipping is a recognized part of life in this region of the world. Some local staff will look to members of the group for personal recognition of particular services provided. In order to make things easier for you, the Tour Leaders may organise a group's tips kitty and if this is the case, they will account for it throughout the tour. Accordingly, you should allow US$50 for group tipping. 10% is expected in restaurants. Carry all your funds in US cash NOT Sterling or Travellers Cheques which are more difficult to exchange. We recommend to take a minimum of US$400-$500 of your total spending money in cash, in mixed denominations. Notes should be in good condition otherwise they might be difficult to exchange. Guatemala: Visas are not required for UK, New Zealand, Australian, US and Canadian citizens. Honduras: Citizens from UK, New Zealand, Australia, New Zealand and most EU nationals do not require a visa. Other nationalities should consult the relevant consulate. Other nationalities should consult their local embassy or consular office. Nothing compulsory, but we recommend protection against typhoid, infectious hepatitis and polio. Please consult your travel clinic for the latest advice on Malaria, Dengue and Zika Virus. Please take preventative measures to avoid mosquito bites - these include mosquito repellent as well as long trousers and long sleeve shirts to cover up when necessary. Please note many countries in Central America, South America and the Caribbean require a yellow fever vaccination certificates if travelling from infected areas. A detailed list of these countries can be found on the NaTHNaC website - http://travelhealthpro.org.uk/countries. Also on the NaTHNaC site there is a list of Countries (and specific areas within a country) which are at risk of infection and a vaccination is therefore recommended. Please check the latest requirements with your travel clinic or doctor prior to departure. The above is not an exhaustive list. Further information regarding vaccinations and travel health advice can be found by following the NHS and NaTHNaC links at Explore Travel Health and from your local healthcare provider. Visa and vaccination requirements are subject to change and should be confirmed by you before travelling. We have planned the dates of this tour to coincide with the Day of the Dead Festival in Guatemala. This festival departure includes the All Saints Day celebrations and a giant kite festival.